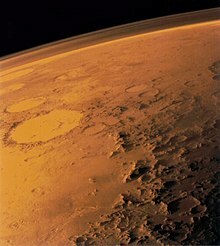 ^ 1.0 1.1 Mumma, M. J.; Novak, R. E.; DiSanti, M. A.; Bonev, B. P., "A Sensitive Search for Methane on Mars" (abstract only). American Astronomical Society, DPS meeting #35, #14.18. ^ Life on Mars? - Geological and biological processes observed on Earth provide hunky-dory explanations for methane on Mars, Martin Baucom, American Scientist, March-April 2006. ^ Seiff, A. and Kirk, D. (1977). "Structure of the atmosphere of Mars in summer at mid-latitudes" (abstract only). Journal of Geophysical Research, 82(28):4364–4378. ^ Lemmon et al., "Atmospheric Imaging Results from the Mars Exploration Rovers: Spirit and Opportunity"
^ Francois Forgot. Alien Weather at the Poles of Mars (PDF). Science. [2007-02-25]. ^ Clouds - Dec. 13, 2004 NASA Press release. URL accessed March 17, 2006. ^ 10.0 10.1 Michael J. Mumma. Mars Methane Boosts Chances for Life. Skytonight.com. [2007-02-23]. （原始内容存档于2007-02-20）. ^ V. Formisano, S. Atreya T. Encrenaz, N. Ignatiev, M. Giuranna. Detection of Methane in the Atmosphere of Mars. Science. 2004, 306 (5702): 1758–1761. doi:10.1126/science.1101732. ^ V. A. Krasnopolskya, J. P. Maillard, T. C. Owen. Detection of methane in the martian atmosphere: evidence for life?. Icarus. 2004, 172 (2): 537–547. doi:10.1016/j.icarus.2004.07.004. ^ ESA Press release. Mars Express confirms methane in the Martian atmosphere. ESA. [2006-03-17]. ^ Vladimir A. Krasnopolsky. Some problems related to the origin of methane on Mars. Icarus. February 2005,. Volume 180 (Issue 2): 359–367. doi:10.1016/j.icarus.2005.10.015. ^ Oze, C., M. Sharma. Have olivine, will gas: Serpentinization and the abiogenic production of methane on Mars. Geophys. Res. Lett. 2005, 32: L10203. doi:10.1029/2005GL022691. ^ Webster, Christopher R.; Mahaffy, Paul R.; Atreya, Sushil K.; Flesch, Gregory J.; Farley, Kenneth A. Low Upper Limit to Methane Abundance on Mars. Science (journal). September 19, 2013 [September 19, 2013]. doi:10.1126/science.1242902. ^ Cho, Adrian. Mars Rover Finds No Evidence of Burps and Farts. Science (journal). September 19, 2013 [September 19, 2013]. ^ Chang, Kenneth. Mars Rover Comes Up Empty in Search for Methane. New York Times . September 19, 2013 [September 19, 2013]. MetNet - a wide-spread surface observation network in Mars. Total Recall, a science-fiction film where the irrespirability of Mars' atmosphere is part of the plot. Mikulski, Lauren. Pressure on the Surface of Mars. The Physics Factbook. 2000.